During the warmer months, no one needs to sell Olympic National Park to visitors. Breathtaking 360-degree views that stretch from Vancouver Island over the Strait of Juan de Fuca and into the interior Olympic range are enough to draw thousands of visitors from all over the world to Hurricane Ridge on a typical summer day. Come winter, things tend to quiet down a bit. Yes, the parking lot still fills up sometimes, but limited road access and variable weather pushes the visitor count down to around 1,000 people on popular winter weekends. 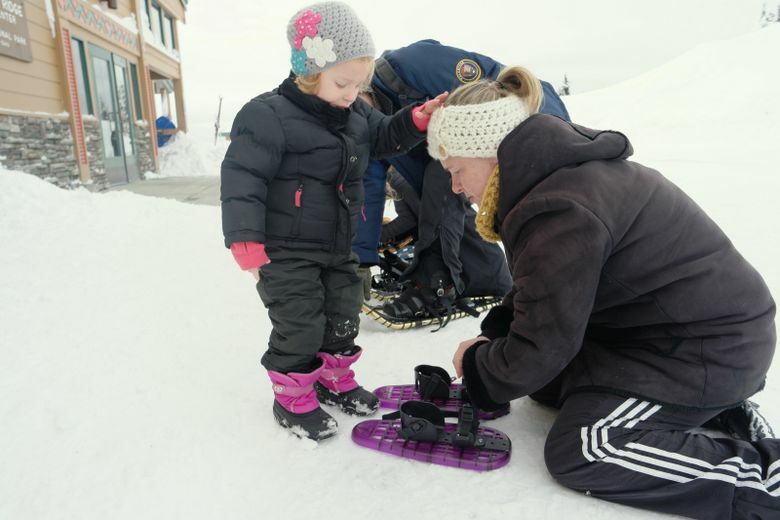 Most are families from the Port Angeles and Sequim areas, up for a day of skiing, snowshoeing or innertubing. A handful make the trek from Bainbridge Island and the Kitsap Peninsula. My fiancé and I, on a recent weekend trip from Seattle, were the tourists. It was an unexpected but refreshing realization, to feel like an outsider in a place we had visited at least a dozen times before. And the spectacular views were still there, made even more dramatic by the abundant early-season snowfall. Winter is a great time to rediscover Washington’s national parks. Fewer crowds, readily available lodging, and a variety of snow-sport activities add up to a stress-free, relaxing escape from the city — just the way our national parks should be experienced. When we arrived at Hurricane Ridge, several inches of untouched powder snow lingered from the last storm cycle, preserved by unusually cold temperatures and the standard weekday road closure. But Frank Crippen, director of the ski school at the Hurricane Ridge Ski Area, had his eyes on the water. “You can actually do a surf check from a couple of spots around here,” he said while giving us a quick tour of the local ski hill. By the standard of most resorts in the Cascades, the nonprofit Hurricane Ridge Ski Area is tiny. There are two rope tows and one surface-level Poma lift, offering a total vertical drop of 800 feet. It gets just 5,000 skier visits in an average year. What it lacks in size, Hurricane Ridge makes up for with a friendly ski culture and extensive backcountry access. The lifties toss footballs back and forth with kids on snowboards. 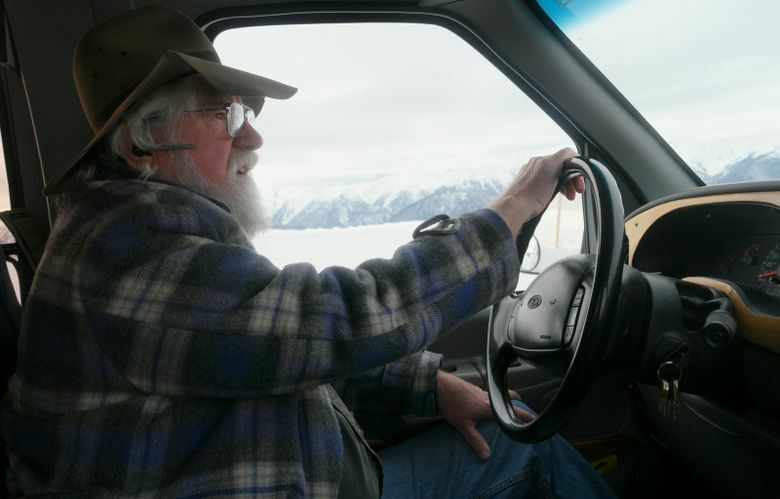 A shuttle driver named Willie Nelson (yes, that’s his real name) offers free rides back up the hill to backcountry skiers and snowboarders making laps off Sunrise Ridge. Everyone knows everyone, and it’s not uncommon for parents to drop their kids off at the base area and head out for a backcountry tour. Aside from being home to one of only three remaining ski areas located within U.S. national parks, the Olympic Peninsula is also one of few places where you can ski within 20 miles of the nearest surfing access. A popular springtime endeavor for locals is the “Triple S Challenge”: skiing (or snowboarding), surfing and single-track mountain biking, all in the same day. Crippen, who grew up in Seattle but moved to the peninsula in the 1990s, owns a shop in Port Angeles called North by Northwest. It caters to all board-based sports. That synergy isn’t lost on Jill and Russ DeGroote, who moved to Port Angeles from Iowa with their four children just before Christmas. After a full morning of skiing, I swapped footwear and headed toward the park service visitor center for a 90-minute snowshoe walk led by ranger Caroline Walls. Our group of 13 followed a gentle half-mile loop through the forest as Walls explained how various trees, animals and birds survive the winter and conserve their energy during the colder months. 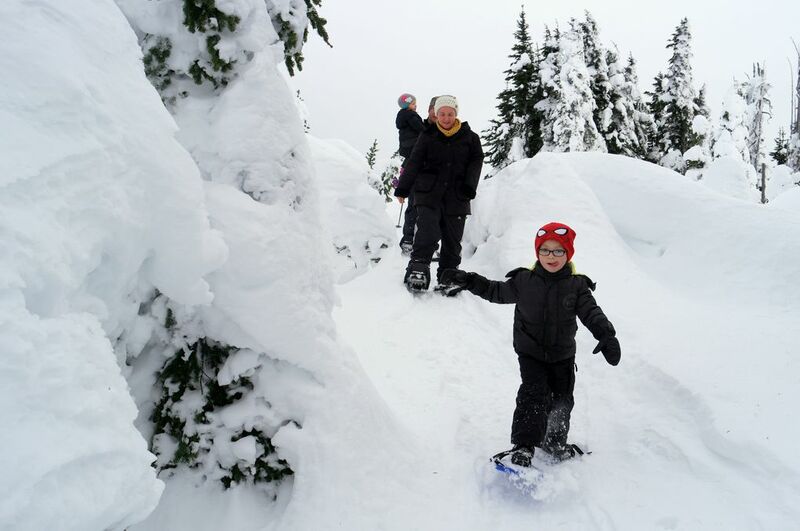 Other popular snowshoe destinations accessed from Hurricane Ridge include Hurricane Hill, the Wolf Creek Trail and the Obstruction Point Road (closed to vehicles during the winter). Rangers warn that there are no marked or groomed trails for snowshoers or cross-country skiers, and that some routes pass through avalanche terrain. Pack the appropriate safety gear and check in with rangers before embarking on any extended backcountry treks. Want to just sit back and enjoy the ride? The Hurricane Ridge Ski Area offers innertubing for $10 an hour, including tube rental and a push down the slope. There is also a small snowplay area where sledding is allowed for kids 8 and younger, free of charge. Skiing in the Olympic Mountains predates the park’s formation. In the 1930s, the construction of a Civilian Conservation Corps lodge and a rough, one-lane dirt road to Deer Park made it the place to be for local winter sports enthusiasts. Two decades later, another construction push brought a two-lane road to Hurricane Ridge, where the ski area moved in 1958. 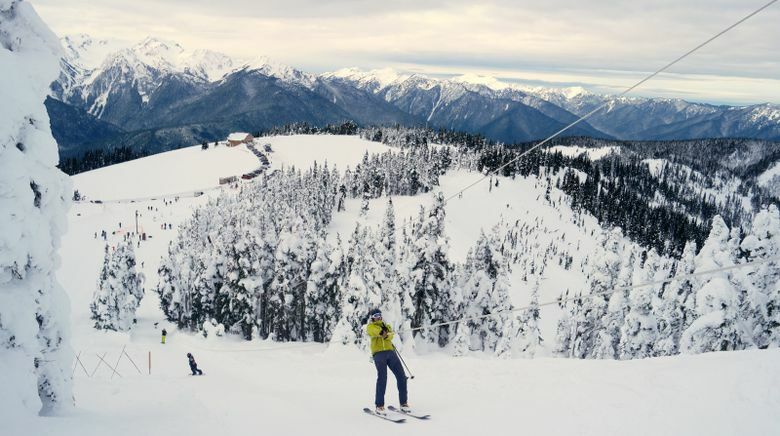 Aside from the addition of the Poma lift in the 1970s, skiing at Hurricane Ridge has remained relatively unchanged since then, even as larger resorts consolidated ownership and invested in high-tech equipment. 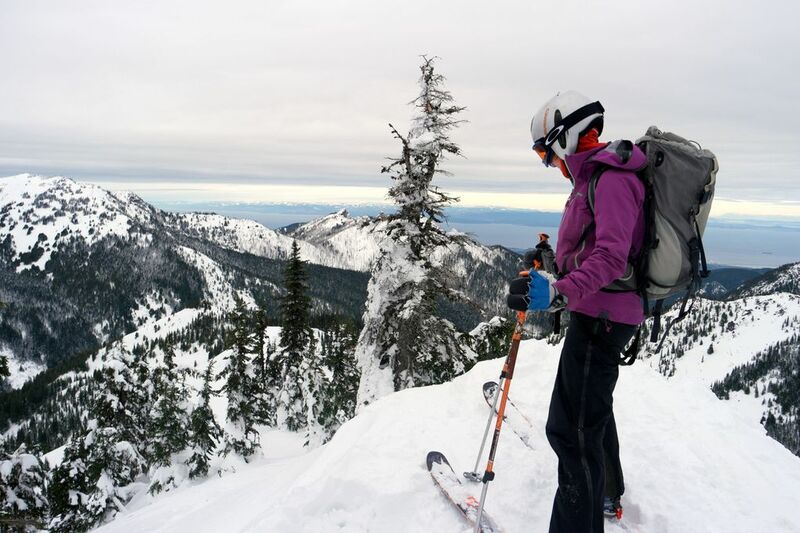 But if there’s one thing that’s drawing more out-of-towners to Hurricane Ridge in the winter, it’s the area’s unrestricted access to limitless backcountry terrain. “It’s just gotten super on-the-radar lately,” Crippen said. Venturing out along Sunrise Ridge on our second day in the park, it was easy to understand the draw. A short rope-tow ride and straightforward traverse brought us to the top of several runs of varying steepness, running off both sides of the ridge. Patroller Russ Morrison, who has skied at Hurricane Ridge since 1968, pointed out all the descent options as we skinned through the trees. One popular line called Maggie’s Run is named after a plow operator who got stuck on a tight corner several decades ago and had to wait out the storm in his rig. We ended up dropping in at a saddle that rises to meet 6,545-foot Mount Angeles, with 800 or so feet of soft turns bringing us back to the road. After hitching a ride up to the parking lot, I asked Morrison to sum up skiing at Hurricane Ridge in one sentence. The Olympic National Park road to Hurricane Ridge is open to uphill traffic in winter from 9 a.m. to 4 p.m. Friday-Sunday and holiday Mondays, conditions permitting. Downhill traffic must exit the park by 5 p.m. All visitors are required to carry tire chains and pay a park entrance fee of $25 (good for seven days). Check the road status on Twitter, @HRWinterAccess, or call 360-565-3131. Ninety-minute ranger-guided snowshoe walks take place at 2 p.m. on weekends and holidays. Cost is $7 for adults, $3 for children 6-15 years old, and free for ages 5 and younger. Snowshoes are provided for the guided walks, and are available for rent for other use. The nearby town of Port Angeles offers plentiful hotels, and cabin and room rentals. See olympicpeninsula.org/places-to-stay for a list of options. 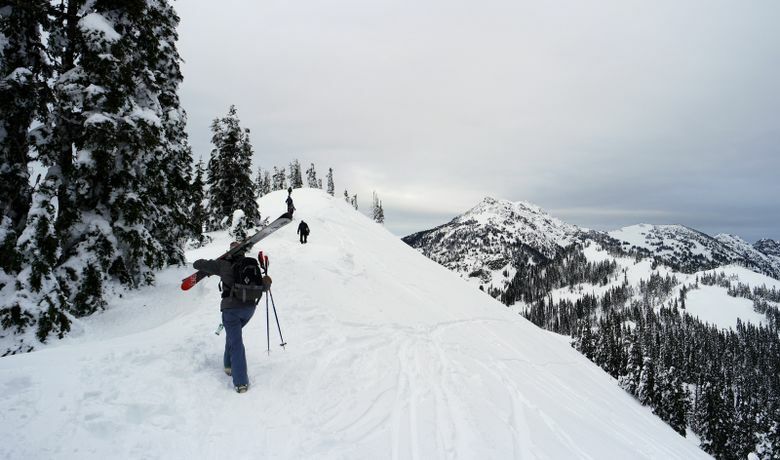 Mount Rainier National Park is a popular winter destination for snowshoers, sledders and backcountry skiers. The road to Longmire and Paradise is open to uphill traffic from 9 a.m. to 4 p.m. daily in winter, conditions permitting. The gate closes at 5 p.m. nightly. All visitors are required to carry tire chains and pay a park entrance fee of $25 (good for seven days). Check the road status on Twitter, @MountRainierNPS, or call 360-569-2211. Ranger-led snowshoe walks are offered on a first-come, first-served basis for adults and children 8 years and older at 11 a.m. and 1:30 p.m. on weekends and holidays. Snowshoes are provided for the guided walks ($5 donation requested), and are available for rent for other use. The snowplay and sledding area at Paradise is open through mid-March. Bring your own plastic sled, inner tube or saucer. Toboggans are not allowed. Winterlodging is available at the National Park Inn at Longmire or in the nearby towns of Ashford and Elbe. Most road access to the park and its affiliated national recreation areas is closed to visitors in winter, but a handful of snowshoeing trailheads remain accessible by car on the western side of the Highway 20 closure, including Thunder Knob and, for those with advanced skills, Sourdough Mountain.